Uncanny X-Men #31 the culmination of “The Last Will and Testament of Charles Xavier,” Original Sin, and AXIS. The arc as a whole has been entertaining enough, but the highlights for me were the smaller character moments. One of my favorite new mutants since Marvel kicked off its All-New imprints has been Eva Bell, and issue #31 does a great job putting her front and center. This issue we start out where #30 left off. Matthew Malloy has caused the death of Cyclops, Magik, and Emma; while Eva transports a younger Charles Xavier to the future to aid in the crisis against Mr. Malloy. At the beginning of the issue, the New Xavier students are dumbfounded by the sudden appearance of Eva and a young Xavier. A hologram of Scott Summers is activated at the school, with a pre-recorded message instructing the students to travel to the Jean Grey School for safety in case of total chaos. As that happens, Malloy loses full control of his abilities and seems to annihilate every X-Man present. Eva and Xavier jump back in time to the moment when Malloy’s parents met, and Xavier telepathically convinces the would be Malloys to stay away from each other, erasing Matthew’s existence from history. Now back to their respective timelines, She-Hulk continues reading Xavier’s will, leaving Scott the old school. Cyclops agrees to sign it over to Ororo on the condition that she take in his students, as he officially shuts down the New Xavier School. 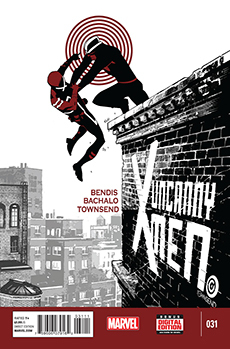 Once again, the cover to one of Bendis’s X-Men stories has nothing to do with the issue’s contents. “The Last Will and Testament” arc has been unnecessarily dragged on, but I was able to enjoy this issue on its own merits as opposed to the previous issues that had gone off the rails at times. The newly fractured relationship between Eva and Cyclops excites me to see what the future holds for these two, regardless of how much of a cop out it felt to kill off so many characters with no real consequence. I’m also hopeful that some light will finally be shed on Xavier secretly marrying Mystique, otherwise this whole arc was a pointless build up. Bachalo’s pencils on this issue continue to be impressive, not much has changed. The inks are by Tim Townsend, Marc Deering, Wayne Faucher, Mark Irwin, Jaime Mendoza, Victor Olazaba, and Al Vey; but it’s impossible to tell when one ends and another begins. The colors, by Bachalo and Antonio Fabela, tie everything together beautifully.